If you are familiar with malware, this is typical of a piece that uses an algorithm to generate domain names to call out to. If we want to block these domains in the future, we must reverse the process of generating these names and implement our own version. 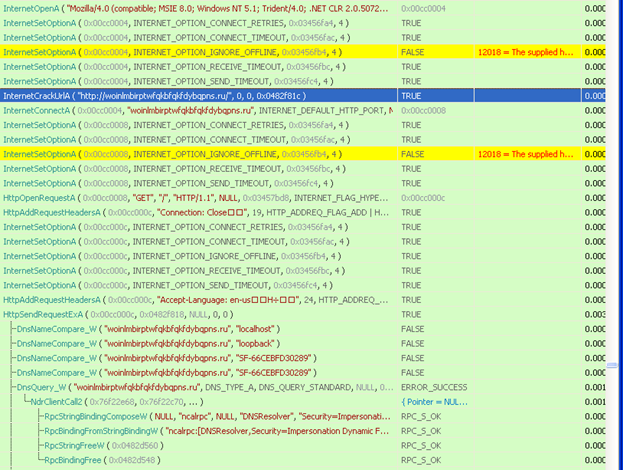 So we must figure out how these likely malicious instructions are injected into Explorer and then what the algorithm it uses to generate domains is. I will try to be brief about the other functionality of the malware so that I can focus more finding and decoding the DGA algorithm itself. To figure out what it does, we need to unpack it for analysis (assuming that it is packed). Look at all that tan (unexplored space) in the navigation band. No Bueno. This is a key indicator that this executable is packed. So let’s unpack this thing. The binary reads in more data from itself using ReadFile. Nothing will execute in the main memory segment until the file is finished unpacking. This usually means that we are going to be modifying our binary (unpack data into), so the binary needed to set permissions to write over these areas in memory, unpack itself, and then reset those permissions back. We see this again a few more steps later. Note the PUSHAD/POPAD instructions surrounded by a loopd instruction, this is yet another signature of code being packed/unpacked. Usually an unpacker will save all of the registers before unpacking and then restore them to their original state afterwards. This instruction is placing the value 0x000253C3 into ESI then adding it to EDI, which points to the base address of our current executable (0x400000). ESI will then contain 0x004253C3. This address is eventually placed on the stack and returned to. This is the first time an instruction has been executed in the original memory address since entering the allocated range. This is the "OEP" (Original Entry Point). 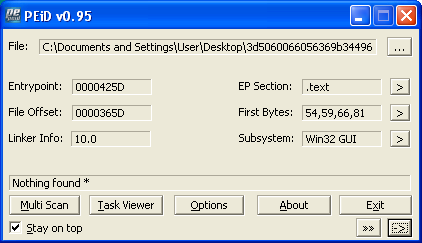 This executable is now unpacked. But now you have to somehow write it to disk. Just make sure EIP is pointed to OEP 0x004253C3. 2. 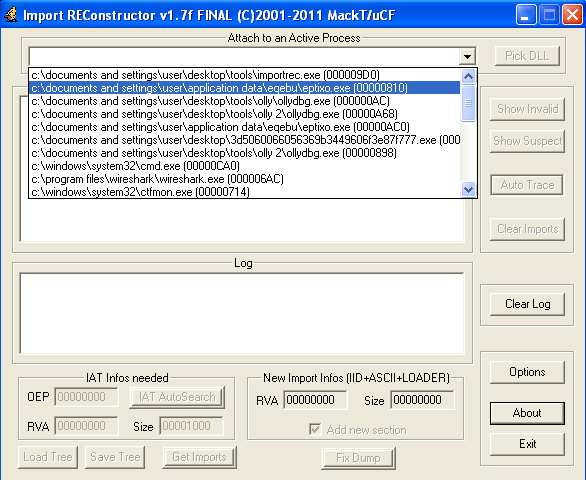 Under “Attach to an Active Process”, select the currently-debugged child process you just dumped this executable from. 3. Enter 253C3 in the “OEP” field (Remember 004253C3?). This is the offset of the OEP from 400000 in the file. 4. Click “IAT AutoSearch”. 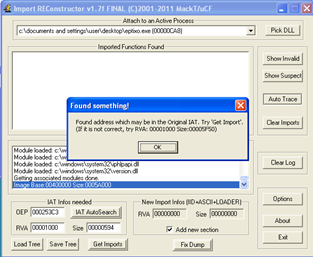 It should say that it may have found the Original IAT (Import Address Table). 6. 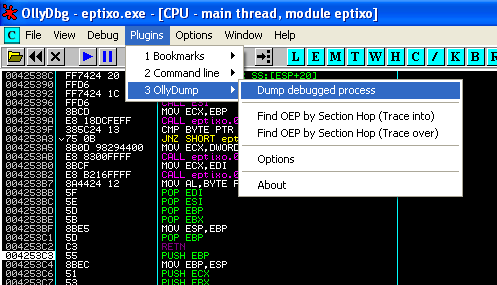 Click “Fix Dump”, select the binary you are currently working on and click “Open”. 7. It should save it as the same name as the selected binary with an underscore at the end. It is now dumped! Check it out in IDA now… Much better! Clearly, there is some more information in the tan area that will probably be used later. 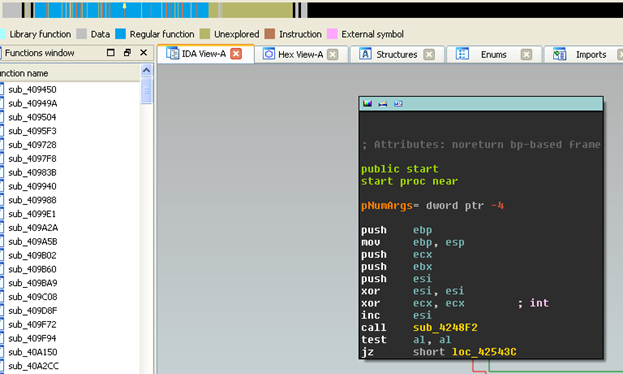 However, now that the executable is dumped, it is much easier to get an idea of what is going on with the use of this static data combined with dynamic analysis. In the next post, I will go into catching the injection into the explorer process and landing at the entry point. Thanks for reading! Thank you for providing a very clear analysis of the code. I hope to see the follow-on soon! Great analysis. It's nice to see someone "show the work". It is much more convincing than the vague hand waving a lot of analysts provide. They are like the college professor who messes up a derivation and then states "...and then a miracle occurs." Haha, thanks Ken. I appreciate it. Check out parts II and III which are already posted.